I don’t knit as much as I would like these days. I write a lot, but all in corporate litigation practice (and I’ll spare my gentle readers from the delights of that vocabulary). Writing this post makes me remember fondly learning the Roositud technique in Estonia. These socks were knitted out of Wollmeise, with enough of the contrast coming from a taste of Wollmeise pack. As my sister points out, Roositud is just reverse fairisle, and it makes a very nice pattern on the socks. The pattern is Roosimine, and includes a very detailed tutorial on the inlay technique. More technical details here. 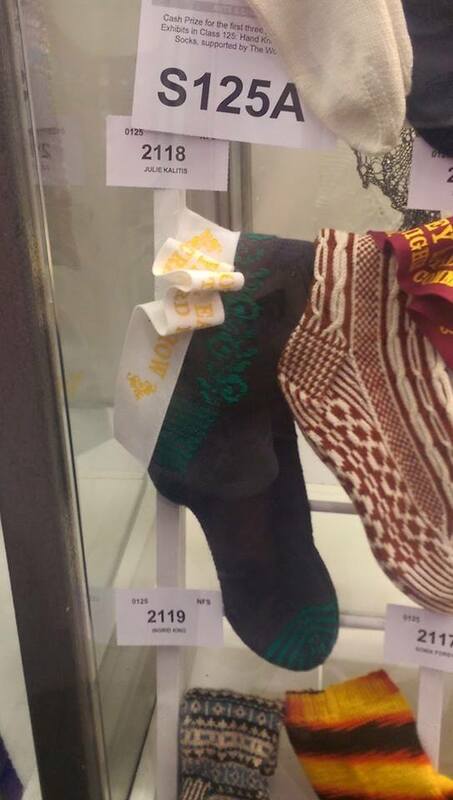 They were entered in the Sydney Royal Easter show, and I was surprised (the Roositud is quite uneven on the first sock) to receive a third prize.